You might be interested in these questions that I was asked by the pupils of Rufford Primary. This includes such important things as my favourite food! Otherwise read on! Emma was born and raised in Edinburgh. At one time she lived in a house that a lot of people thought was the childhood home of author Robert Louis Stevenson – they used to come and take pictures of it – only it wasn’t. As a child she was a bookworm, and especially liked historical fiction – maybe that was why she chose to study history at university.Afterwards she lived and worked in London, Colorado (USA) and Cambridge, before settling in Leeds in Yorkshire. She still likes to go to America when she can (especially to California in the winter months). She is now a full-time author and lives with her husband and daughter near one of the biggest parks in Europe (Roundhay Park, Leeds) where she loves to go running with her crazy dog. Emma made up her first stories for her younger sister, Rosy. As children they had to walk the family dog each day, on a path next to a golf course. In between dodging golf balls, Emma invented tales about Harvey the Witch’s Dog (the witch was allergic to cats) to keep Rosy entertained. Soon after this she started writing down adventure stories based on Enid Blyton characters – and soon collected a whole drawer of first chapters. Beginning stories is much easier than ending them. Her first writing success as an adult was when she won a short story competition – the prize was a pair of shoes. Nowadays she wears them for school visits. Before she was a published writer, many of Emma’s jobs involved writing – about peculiar things like banana trade wars. But in her spare time she was always writing stories. 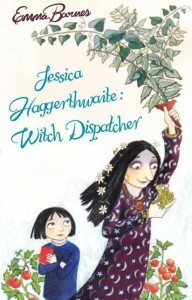 Eventually she struck lucky, and her first children’s book, Jessica Haggerthwaite: Witch Dispatcher was published in 2001. It won much praise and has been translated into many different languages. Since then Emma has written more books. She has won some awards. She also spends time working in schools and libraries, where her aim is always to spark children’s imaginations and create a passion for writing and stories. Want to know more? Look at the FAQs.